Two weeks ago, I realized that even though I have a stack of books I still “need” to read, I wasn’t feeling drawn to them (poor neglected books – most of them have been sitting on the shelf for at least a year, and I know of at least two that are pushing the decade mark). I put a call out for suggestions on Google+, and a friend of my husband’s from college (who, based on her amazing taste in books and sense of humor, has become someone I consider my friend too, although we’ve only met once, briefly, in person) came to my aid. She provided me with a list of about twelve books she thought I would like after perusing my taste on goodreads.com and categorized them as “Great,” “Very Good,” or “Good and Fun.” This is a perfect breakdown from my perspective. “Great” and “Very Good” books, like The Night Circus and So Long, See You Tomorrow tend to be serious, though undeniably compelling reads. These are books I might have passed over before starting this project because I have a thing about getting too depressed from my sources of entertainment (weird personal pet peeve), but now that I have to read so many books every week, I have room in my literary diet for all sorts of things! The “Good and Fun” category, some of which I had already read and enjoyed tends to be my go-to – I love to laugh, and I especially enjoy characters who are witty, secretly sweet and outwardly foolish. I’ve been encouraging myself to save the books in this group for the moment since, as it turns out, I’m actually quote enjoying a more serious turn (must be a winter thing). I was especially surprised by how much I liked So Long, See You Tomorrow. I knew going into it that this was not a happy book, and yet somehow I was drawn to this little excerpt from its description on Amazon: Out of memory and imagination, the surmises of children and the destructive passions of their parents, Maxwell creates a luminous American classic of youth and loss. I was curious about a “new” classic, something maybe in the vein of Where the Red Fern Grows. It turns out that this reminded me more of Ethan Frome, with the same inevitable spiral o’doom, written with a deft hand for story-telling. Now, I as far as I know, I’m the only person who read Ethan Frome in high school and liked it better than The Catcher in the Rye, but then again, I’ve always been more than a little odd. Anyway, Maxwell is well worth a read, and I’m really looking forward to finding his other books. He is, I feel, an underrated American author, not because he wasn’t well-known by other authors of his time (he was 91 when he died in 2000 and quite beloved by renowned writers such as John Updike, JD Salinger, and Frank O’Connor both in his time as editor at The New Yorker and as a writer of fiction), but because school curriculums overlook him (and many others) in favor of well-tread material. As someone who loves the classics, I still feel the need to say (over and over) that exposing students to lesser known and new authors alongside tried and true talents can only expand comprehension, as well as the ability to compare how history and style play a major role in literature. Critical thinking, people – it’s where it’s at! I will leave you with one of my favorite (non-spoiler) moments from the book. I was stopped cold by it because I’ve had this same feeling so many times myself. Maxwell was one of the great writers of the 20th century, underrated only in the way hat he is not a household name. And maybe it’s just fine that his work doesn’t get slaughtered in high school and therefore remains on the list of the great discoveries of a reader’s journey. 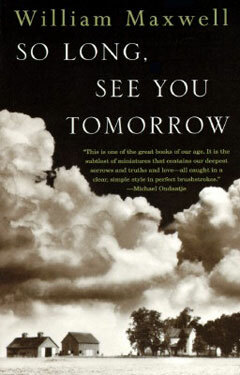 I feverishly read “So long, see you tomorrow” in one sitting – and have reread it repeatedly at a more suited pace since. Maxwell has the signature hand of the great writer that makes the aspiring writer realize: “Ah, that’s how it’s done”, only of course to realize that this precious insight turns out to be but a delicious delusion about one’s own capacity. There are paragraphs and sentences that are just short of heart stopping.Quiet. Carefully crafted. Weightless. A moment of unspectacular truth. Only of course, that also turns out to be a delusion about the width of one’s own comprehension. I am happy I found your review. Thanks for writing it! I’m so glad you stopped by. I’m thrilled to find others who love Maxwell as much as I do. I only have a few minutes right now to look at your blog (and I want to give it more careful consideration), but after reading your “About Me” section, I just have to ask if you’ve read The Night Circus by Erin Morgenstern. I very much hope you have, but if not, I strongly recommend it. I reviewed it here last month and I already wish I had time to read it again. I may be wrong, but I think it could be right up your alley. Indeed our preferences seem to converge … I have just ordered The Night Circus after reading a few pages in a friend’s copy. I am very much looking forward to it. Right now I am finishing the Cat’s Table by Michael Ondaatje, an increasingly known author I have liked for many years. I think you might enjoy “A Winter’s Tale” by Mark Helprin and “The Ghormenghast Novels” by Mervyn Peake. I will continue following your reviews to find new treasures. Thank you! I went to copy and paste all three of those books into my “Books to Read” doc and realized a friend had recommended The Cat’s Table to me already as well! I guess I better move that one to the top of the list for next week!